2 GOUAULT Pierre Roubaix-Lille Metropole s.t. 5 SWIFT Connor Madison Genesis s.t. 6 DUMOULIN Samuel Ag2r La Mondiale s.t. 7 VAN MELSEN Kevin Wanty-Groupe Gobert s.t. 8 MAURELET Flavien St Michel-Auber 93 s.t. 9 RUSSO Clément Fortuneo-Samsic s.t. 10 TURGIS Jimmy Cofidis s.t. 11 ISTA Kevyn WB Aqua Protect Veranclassic s.t. 12 NÕMMELA Aksel Beat Cycling Club s.t. 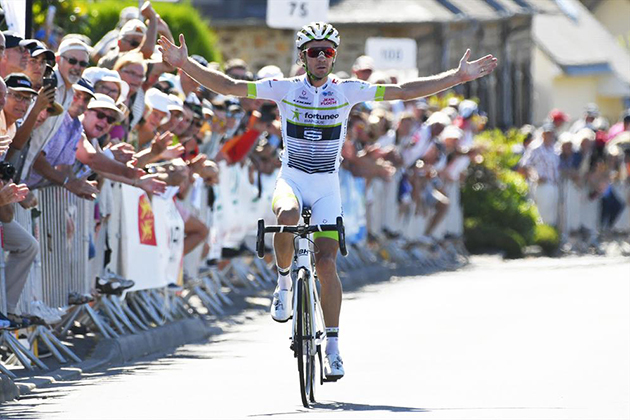 13 MADOUAS Valentin Groupama-FDJ s.t. 14 RAIBAUD Jimmy Groupama-FDJ s.t. 16 LIEPINS Emils One Pro Cycling s.t. 17 LE CUNFF Kévin St Michel-Auber 93 s.t. 18 PEYSKENS Dimitri WB Aqua Protect Veranclassic s.t. 19 GAFFURINI Nicola Sangemini-Mg. K Vis s.t. 20 FEDELI Alessandro Delko-Marseille Provence s.t. 21 DELAPLACE Anthony Fortuneo-Samsic s.t. 22 OFFREDO Yoann Wanty-Groupe Gobert s.t. 23 COMBAUD Romain Delko-Marseille Provence s.t. 24 VERMEER Tom Differdange Losch s.t. 25 HAVIK Piotr Beat Cycling Club s.t. 26 IDJOUADIENE Pierre Roubaix-Lille Metropole s.t. 27 OURSELIN Paul Direct Energie s.t. 28 HOLMES Matthew Madison Genesis s.t. 29 VANTOMME Maxime WB Aqua Protect Veranclassic s.t. 30 LE ROUX Romain Fortuneo-Samsic s.t. 32 PUCCIONI Dario Sangemini-Mg. K Vis s.t. 35 MUDGWAY Luke H&R Block s.t. 37 ORAM James One Pro Cycling s.t. 38 THOMINET Camille St Michel-Auber 93 s.t. 39 BAYLIS Thomas One Pro Cycling s.t. 47 PRODHOMME Nicolas Ag2r La Mondiale s.t. 50 MÜNSTERMANN Per Team Sauerland NRW s.t. 51 HODAPP Johannes Team Sauerland NRW s.t. 54 TOTO' Paolo Sangemini-Mg. K Vis s.t. 55 DE ROSSI Lucas Delko-Marseille Provence s.t. 56 BAGOT Yoann Vital Concept s.t. 57 MAINARD Jérôme Roubaix-Lille Metropole s.t. 58 LEVARLET Guillaume St Michel-Auber 93 s.t. 59 JAKIN Alo St Michel-Auber 93 s.t. 64 COSNEFROY Benoit Ag2r La Mondiale s.t. 67 VAN DER PLOEG Neil Madison Genesis s.t. 68 MALDONADO Anthony St Michel-Auber 93 s.t. 70 SALVIETTI Niccolo Sangemini-Mg. K Vis s.t. 71 LEMOINE Cyril Cofidis s.t. 72 VAUGRENARD Benoit Groupama-FDJ s.t. 73 TURGIS Tanguy Vital Concept s.t. 74 DAVY Clément Groupama-FDJ s.t. 76 ROZSA Balazs Differdange Losch s.t. 83 MORIN Emmanuel Cofidis s.t. 86 MENGOULAS Alex Beat Cycling Club s.t. 91 THIBAULT Jean-Denis H&R Block s.t. 92 GALARRETA David H&R Block s.t. 93 DOMNICK Julius Team Sauerland NRW s.t. 95 DUVAL Julien Ag2r La Mondiale s.t.